Quick Preview lets you easily and quickly turn on and off multiple groups of layers, effects and/or masks in any comp or pre-comp so you can "Preview" your comps faster. Work in real time just by turning off all unnecessary layers, effects and/or masks while you work. When you are finished turn them back on in one click. This is a great workflow tool. Save/Load groups (When you reopen After Effects use Load button to load your previously selected groups! 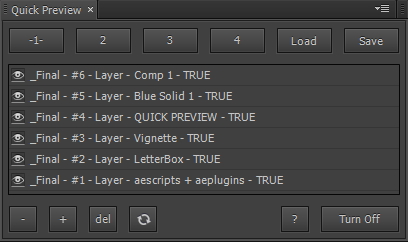 Add layers, effects or masks from any comp in your project or deep in a pre-comp hierarchy! When you reopen the project file use [Load] button to reload the groups you previously set!